According to Scandinavian mythology, Asgard is one of the Nine Worlds and the home of the Aesir gods – here, Odin and his wife Frigg rule supreme. It’s time to visit this world of wonders with Pragmatic Play, who give us the opportunity to live through the magic of Asgard. Asgard is a 5 reel, 3 row, 25 payline slot from Pragmatic Play themed around Norse mythology. It comes with the beauty of four regular game features which are triggered at random, one for each of the gods (Odin, Thor, Loki and Freyja). These features offer rewards such as transforming low paying symbols into wilds, special Loki symbol stacks that become the same symbol, and you can find up to 5 extra wilds and reels landing. 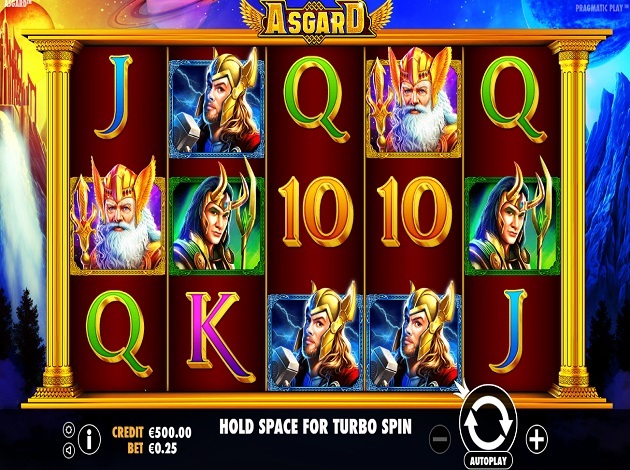 Asgard is an online slot with five reels and twenty five fixed paylines which remain active throughout the gameplay. You score wins with three identical symbols landing next to each other. Choose your combination of coins per line and the value of each coin – you can play on up to 10 coins per line and a value of up to € 0.5 per coin. This means you can play from just € 0.25 per spin up to a maximum of € 125. As usual, the longer the combination the higher the payout, and you will always receive the payout from the highest combination. Besides ordinary symbols, Asgard comes with a number of features which we have only told you about in part. Here’s a bit more about each bonus mode. The Wild symbol is represented by Asgard, and replaces every other symbol except for the bonus, offering prizes up to 20x your total bet per payline. Besides this, you can land a random bonus feature at every spin, with each feature associated to one of the four gods. In the Thor feature, all lower value symbols that land on the reels at the end of each spin will transform into Wilds to create new winning combinations. In the Loki feature, stacks with the Loki special symbol can land on the reels and will be transformed into an identical symbol, resulting in new, big payouts. In the Freyja feature, anywhere between 3 and 5 extra Wilds will be added to the reels at random; and finally, in the Odin feature, Wild stacked reels appear – sometimes more than one if you’re lucky – and you know what happens next, right? When you land the bonus symbol on reels 2, 3 and 4 during the same spin you will trigger the Free Spins feature. There are four Free Spin rounds too here and you’ll be allocated one of them at random. You get five Free Spins in all of them, and in each there will be a modifier associated to the Norse mythology deities. Watch out, if you get the Freyja Free Spins you will get between 3 and 5 extra Wilds during each of your Free Spins. On the other hand, in the Loki Free Spins you will get the transforming symbols on every free spin, and the God symbols will turn into wilds on every free spin in the Thor Free Spins. You will also get stacked Wilds in the Odin Free Spins. The game symbols that land on the reels of Asgard are the four Norse gods as well as card symbols in different colours. There are also two special symbols: the Wild symbol (Asgard) can land on all the reels, forming combinations on its own and replacing other icons, except for the Scatters, when necessary; and the Scatter (a mask) which can only land on the middle three reels. Three Scatters not only earn you a payoff but also trigger free spins. The lower paying cards are the A to 10 card symbols, but the highest paying regular symbols are, in order, Freyja, Loki, Thor and Odin. Asgard is very well designed, with a cartoon atmosphere to the reels which are set against dark skies dotted by lightning, mountains and waterfalls. Pragmatic have done a great job with this Norse-themed video slot. The graphics are well-designed and so is the orchestral soundtrack. You won’t be disappointed when it comes to the action either, as random features will be triggered regularly to further help you score new wins. The game has a medium volatility rating and when you land winning combinations, you’ll find yourself winning decent wins.